Eight UC Berkeley assistant professors are among 126 new fellows announced today by the Alfred P. Sloan Foundation. The Sloan Research Fellowships, awarded annually since 1955, honor early-career scientists and scholars whose achievements and potential identify them as rising stars and the next generation of scientific leaders. Fellows receive $55,000 to further their research. 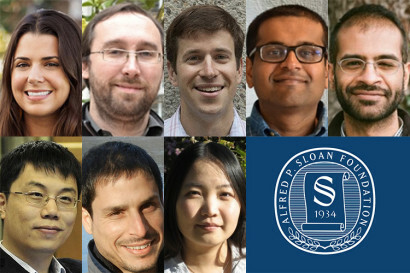 Berkeley’s new Sloan Fellows: Gloria Brar, Hernan Garcia, Evan Miller, Surjeet Rajendran, Nikhil Srivastava, Ke Xu, Nir Yosef and Wenjun Zhang. Wenjun Zhang, an assistant professor of chemical and biomolecular engineering, who seeks to understand and engineer the biosynthesis of natural products for applications related to human health and bioenergy. The 2016 fellows are drawn from 52 colleges and universities in the United States and Canada, and are awarded in eight scientific and technical fields: chemistry, computer science, economics, mathematics, computational and evolutionary molecular biology, neuroscience, ocean sciences and physics. A complete list of the new fellows is on the Sloan Foundation website (PDF). The foundation is a philanthropic, not-for-profit grant-making institution based in New York. It was established in 1934 by Alfred Pritchard Sloan Jr., then president and chief executive officer of the General Motors Corporation.